Here’s the rub. The streetcar is already under construction. Tracks have been laid, utilities have been re-routed, sites have been purchased, cleared and prepared, and contractors are at work building the streetcars. Basically, a great deal of money has been spent and more will need to be spent to unwind the work under contract if the project is cancelled. John Deatrick, project manager for the streetcar, estimates that the costs to cancel are $108-125 million. Yes, you heard that right. We cancel, we spend more than $108 million on nothing. It gets better though. The estimated cost for the entire project is only $132.5 million. For a $8 million difference, you get a project – you get a streetcar. Democrats have a shot at winning back the governor’s office in 2014. Ed Fitzgerald is currently in a virtual tie with Republican John Kasich. Democrats had a chance to build something in Cincinnati. But inter-party squabbling lead them to flush millions down the toilet and get nothing in return. Hell, everyone I talk to thinks it’s insane once they understand the cost of cancellation- conservatives, liberals, zoo animals. The new council of 9 has three strong supporters and two members who are staunchly anti-streetcar. Of the remaining four people, Amy Murray is a newly elected Republican. Write them and tell them not to get involved with John Cranley’s plan to spend more than $100 million on nothing. I don’t think they see the potential for national embarrassment and how this could impact the Democratic race for governor in 2014. Please share this information and help bring some outside attention to the potential impact. Especially if you are an Ohio Democrat. If conservatives want to cancel economic development projects, they should own it. Thank you for your support! And remember, as Ohio goes, so goes the nation! To provide a little background, Cranley’s pitch was that if we cancel the streetcar we could re-prioritize the money on services for surrounding neighborhood communities. Commercials like these blanketed the airwaves in Cincinnati. From Cranley’s campaign reports, we learned that 84% of donations identifiable by party came from Republicans. It’s no secret where his support lies. $40 million of the funding comes from a Federal Transportation Agency grant and must be returned to the federal government if not used on the street car project. No existing services were going to be impacted. His claim about firemen and police officers was simply a lie- this money comes from operating funds, not capital expenditures. Basically, Cranley won the election on a wave of misinformation with support from the neighborhoods who bought into the fear and endorsements from Republican groups like COAST, the conservative Cincinnati Enquirer, and conservative talk radio outlets like 700 WLW. The Cincinnati Enquirer not only endorsed Cranley but uses the usual conservative media tactics to tell the conservative story. Anti-streetcar stories are put on the front page and obscure any facts supporting development. 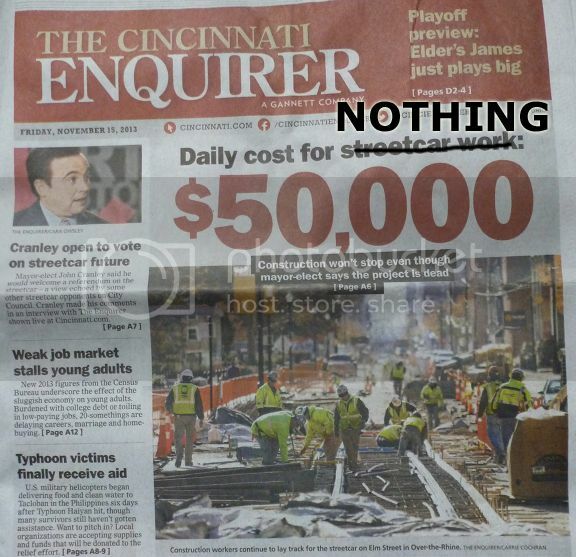 My favorite Enquirer story was the one in which they claimed $50,000 a day was being spent on the streetcar. OMG- $50,000 a day being spent on actual development of a project which has been in the works for years and voters approved twice!!!! Where’s the similar front page outrage when Cranley wants to spend a similar $50K a day and get NOTHING in return? And if there’s any doubt about conservative talk radio’s opinion, just tune in to Willie Cunningham on 700 WLW when he’s discussing the streetcar. WLW’s opinion can pretty much be summed up in the following title: Streetcar Czar Talking to Council. No, John Deatrick is not from Russia. He’s not a socialist “czar”. He’s a non-political project manager who you loved when he completed projects like The Banks and Ft. Washington Way on time and within budget. But now that he’s managing something you’re not in favor of, conservative rage! By now, you get the picture about John Cranley. He’s not acting like a Democrat. He’s acting like a conservative rewarding the people who funded his campaign. My ask of John Cranley- Either act like a Democrat or come out of the closet as a Republican and quit trying to fool people. Why not be proud of your support, John? What are you afraid of? In the meantime, let’s sway Cincinnati city council and not let Democrats take the heat for conservative idiocy. 8:04 AM PT: Councilman P.G. Sittenfeld announced this morning that he will vote to continue the $133 million project.